Native to Chile, Argentina and Brazil, Pampas grass (Cortaderia selloana) is a popular ornamental grass that will add a dramatic statement to any landscape, and is especially striking when planted in groups of three to five. Pampas grass works well when planted behind perennials, where the linear grass will provide contrast in color and form. When pampas grasses mature, they can reach heights up to 10 feet, and span 6 feet across. In summer, tall silvery plumes will grow above the grass, and will sway gracefully in the breeze. Plant Pampas grass where it will be exposed to a minimum of six hours of direct sunlight every day. Pampas grass can grow in poor soil as long as the soil isn't soggy. 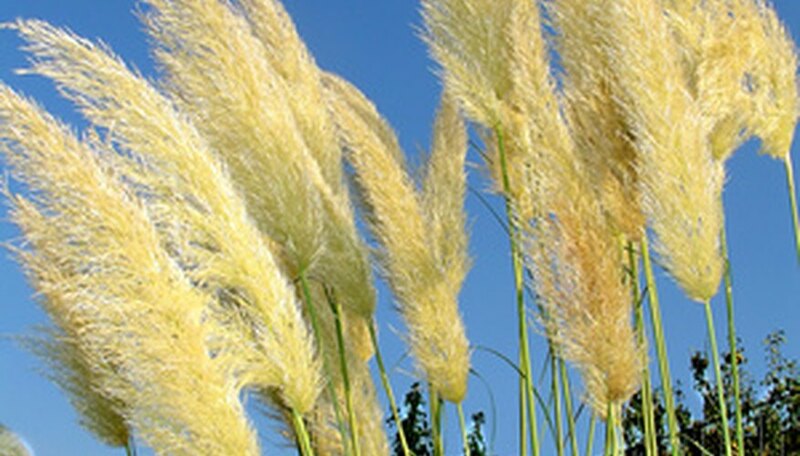 Plant Pampas grass away from houses, children's play areas and sidewalks, because the blades of the grass can be sharp. Give Pampas grass an inch of water per week in periods of no rain. Use a drip irrigation system, or allow a garden hose to drip at the base of the plant. Avoid fertilizing Pampas grass as too much fertilizer will cause the the Pampas grass to weaken. Divide Pampas grasses every three to four years, or when the clumps begin to die down in the center. Dig the entire plant with a garden fork and lift it carefully from the ground. Remove the non-productive area in the middle of the clump of Pampas grass. Cut the Pampas grass into smaller sections with a shovel or saw, and replant the sections. Don't wait until Pampas grass grows too large, or it will be nearly impossible to divide safely. Shear Pampas grass in late winter or early spring, leaving only a a few inches above the ground. Use pruners or electric hedge clippers.